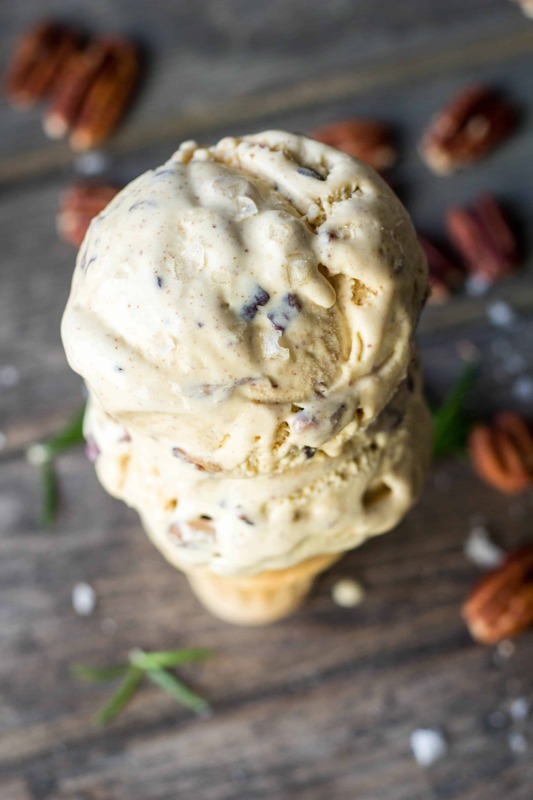 This recipe for Rosemary Brown Butter Pecan Ice Cream is an over the top play on traditional butter pecan ice cream. 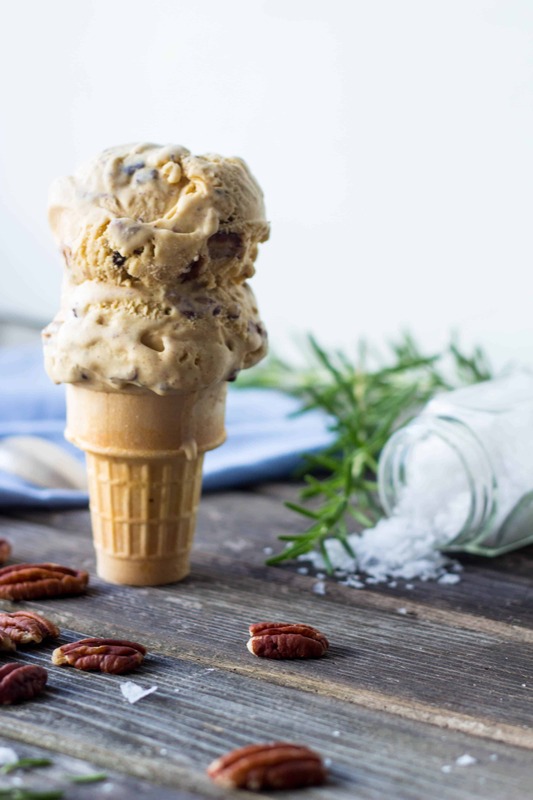 It’s incredibly rich, buttery, and loaded with salty pecans. An epic frozen treat! My garden is currently overflowing with sooo many fresh veggies: beets, carrots, beans, cucumbers, peppers, fresh herbs and the very first sun gold tomatoes of the season(!!). 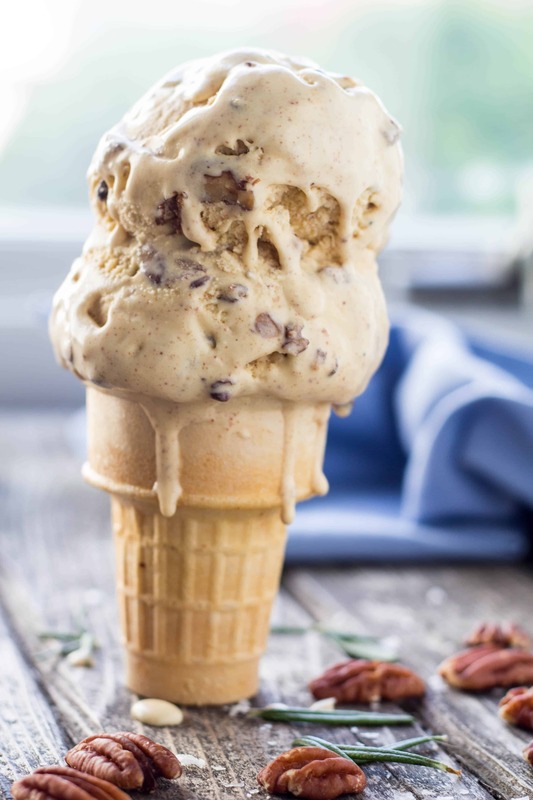 But I’m taking a break from the seasonal produce inspired recipes to bring you the most doggone decadent ice cream I’ve ever churned up. My obsession with brown butter falls somewhere between my obsession with tomatoes and my obsession with flaky pie crust. You’ve seen me mix it into chocolate chip cookies, puree it into butternut squash, and whip it with maple syrup to drench waffles that had also been spiked with brown butter. This stuff is delicious in just about anything, including, as I just discovered, ice cream. 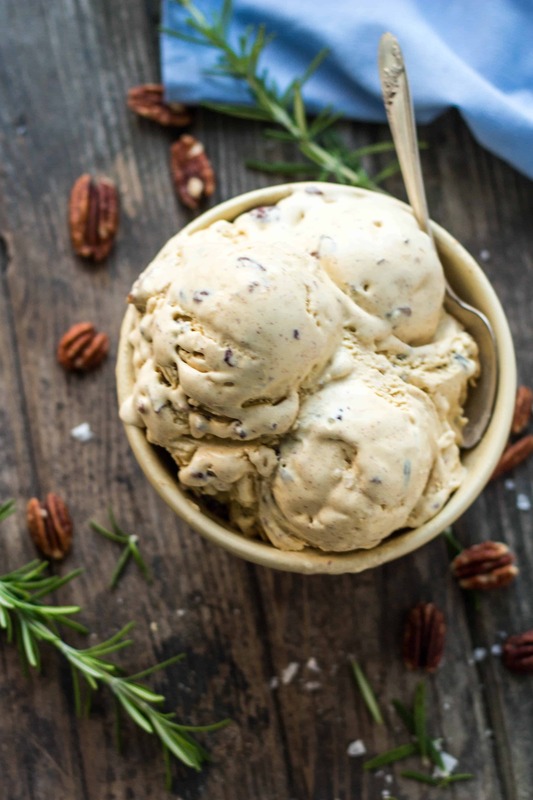 So here it goes: I’m doubling down on your basic butter pecan ice cream by upping the ante with brown butter and a little bit of rosemary. The rosemary is mostly so my garden doesn’t feel left out. Leaving the garden out of summer is like leaving cookies out of Christmas (NOT cool). But also because rosemary and brown butter go together like moonshine and a mason jar. I’ll start by saying this ice cream is rich. Like, richie rich. On top of the usual egg yolks and cream, we’re adding butter to the mix. Lots of it. Are you scared? You probably should be. This stuff is downright dangerous… but in the best way possible. Proceed with caution. You’ve been warned. In the process of developing this ice cream I learned a fun new kitchen trick! Actually, it wasn’t fun at all because I had to throw away a few cups of milk, sugar and rosemary. But a lesson learned nonetheless. You see, in order to increase the deep, caramelly notes of the brown butter, I opted to use light brown sugar instead of the white stuff. So like any other custard-based ice cream, I started by heating the sugar and milk in a saucepan. But as soon as the milk came up to a simmer, it began separating… into curds and whey! Like making ricotta. Don’t get me wrong, I love ricotta. But I didn’t want sweet, rosemary infused ricotta. I wanted ice cream. After further investigation, I realized the brown sugar was the culprit, as it’s made brown from the addition of molasses. Molasses is acidic, and acid will cause heated milk to curdle. Neat, huh? So I started over, only this time whisking the brown sugar into the warm milk just to dissolve, and then proceeding with the recipe from there. Once the egg yolks have been combined with the milk and sugar, it can then be heated, albeit very carefully, to thicken up. The results? Hahaha. You guys, this is the kind of food you put into your mouth and just immediately smile. No words. Just smiles. Giggles, even. And more bites. Lots more. This might not be the most “fresh” or “seasonal” recipe that I could be posting in the middle of July, but one I consider to be just as necessary. If you’re looking for an indulgent summertime treat, folks, look no further. If ice cream with butter in it isn’t your thang, try this much lighter (and easier!) Philadelphia Style Lemon Ice Cream instead. Start by browning the butter by melting it in a medium saucepan over medium heat. Swirl the butter around until it's fully melted, then watch it with a close eye until it foams and then turns a few shades darker and smells nutty. Immediately remove the pan from the heat and pour the butter into a bowl to cool, being sure to scrape in all of the toasted brown bits. In another pan, heat the milk and rosemary sprig until it comes up to a simmer, then remove it from the heat. Allow the rosemary to steep for about 20 minutes. While the milk is still warm, but not too hot, remove the rosemary and whisk in the brown sugar until dissolved. When the butter has mostly cooled, add in the egg yolks and vigorously whisk until thoroughly combined. I used an immersion blender to make this a bit easier, but elbow grease will work just as well. Pour the egg mixture into the pan with the milk and sugar and place over medium-low heat. Use a whisk or rubber spatula to constantly stir and scrape the bottom and edges of the pan until the mixture has thickened enough to coat the back of a spoon. Remove from the heat and pass through a fine mesh strainer to remove any lumps. Whisk in the heavy cream and vanilla extract, then cover and chill the mixture until very cold. This will take several hours or overnight, but can be sped up by place in the freezer and giving it a stir every 15 minutes. 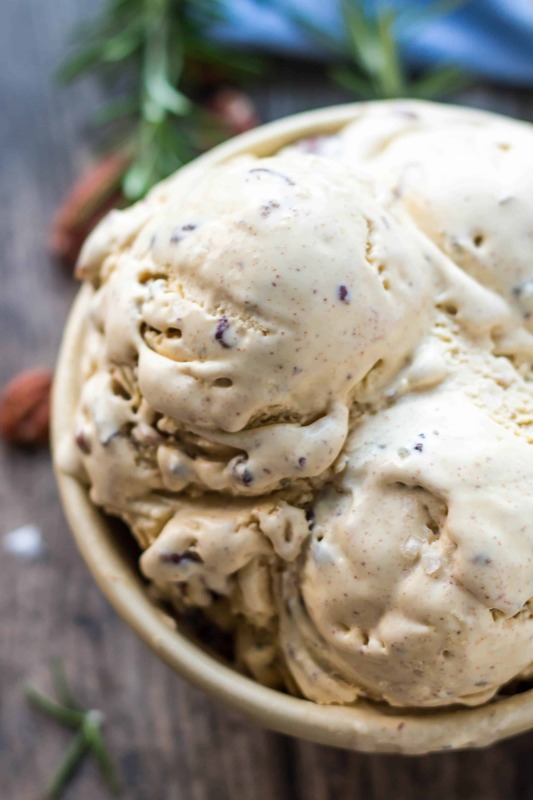 When the mixture is nice and cold, pour it into an ice cream maker and follow the manufacturers directions to churn it into ice cream. While it's mixing, combine the chopped rosemary, flaky sea salt and toasted pecans in a small bowl. A minute or two before the ice cream is done, pour in the nuts/sat/rosemary and let it mix until they're evenly distributed. Remove the ice cream to a container, cover, and freeze until nice and firm. 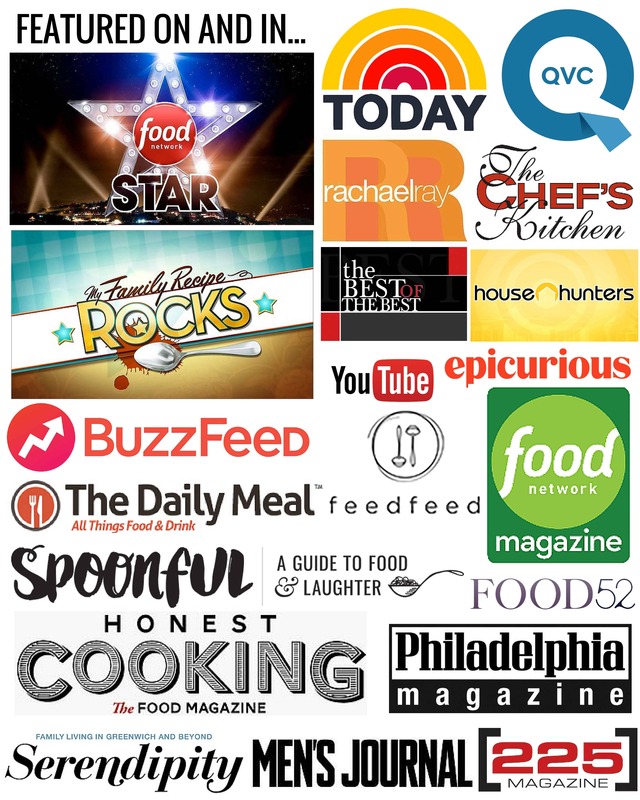 Scoop, eat, repeat! I do not recommend substituting dried rosemary - if anything, leave it out completely. I’m in. I just put the bowl of my ice cream maker in the freezer. it’s seriously disgusting it’s so good. It s amazing how simply cooking a stick of butter in a pan until it reaches a slight shade of brown can completely change the flavor and make it unbelievably decadent.